A chic contemporary Mexican restaurant from chef Diego Hernández. About chef Diego Hernández: The buzz on wineries and restaurants of the Guadalupe Valley in Baja California continues to grow, as foodies seek culinary adventure south of the border. This region is home to Diego Hernández’s Corazón de Tierra, and he’s brought his progressive, farm-to-table approach to Los Angeles for the first time at Verlaine. 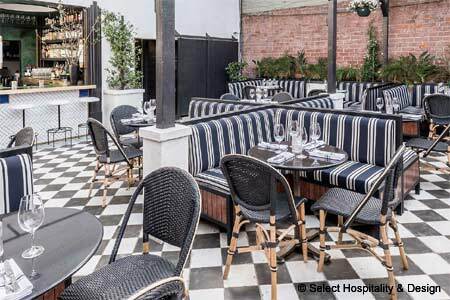 The décor: The former Dominick’s in West Hollywood has morphed into two spaces, with the main dining room being the entirely al fresco patio, covered with a retractable glass roof and dotted with greenery. A black and white checkered floor, jaunty black and white striped banquettes, and sleek black tables are casually chic; the corner bar’s mod white stools offer a lively hangout. 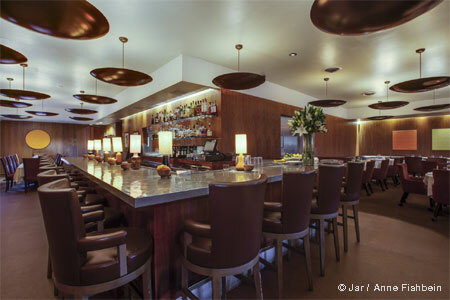 The interior space has been turned into Wild Beast, a cocktail lounge sporting a penny tile floor, wood stylings, and cocktails by John Neumueller, with a separate bar bites menu from Hernández. Likes: The pretty patio; green sorrel tamal. Food & Drinks: Hernández’s contemporary dishes marry progressive, modern Mexican cooking to a California farm-to-table aesthetic. We find the best strategy here to enjoy the lovely patio is to focus on the smaller plates, which outshine the entrées. Grilled oysters are a perfect start with a glass of Domaine Triennes rosé. A fried sardine taco with cactus salad offers bold, satisfying flavors. Don’t miss the grilled tostada topped with ultra-fresh yellowtail, punctuated with avocado, chile crema, ginger, cilantro flowers and a tangy hibiscus dust --- if you get the option to add fresh uni, take it. An ethereal, pale green sorrel tamal is uplifted with a nuanced amarillito mole, Swiss chard and onion ashes. For dessert, avoid the oddly textured peach flan, but choose instead a velvety beet biscocho with cacao sorbet. Craft cocktails are refreshing, particularly the mezcal-based Chartreuse Swizzle. Also find bottled beers and a reasonably priced California/French-leaning wine list.